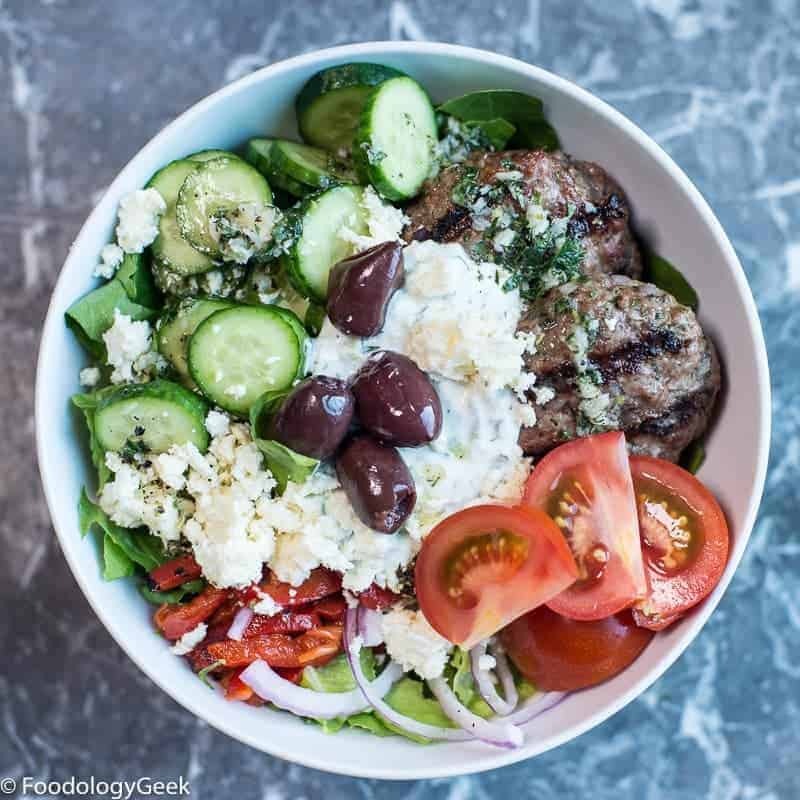 This bowl has all the goodness of a gyro. 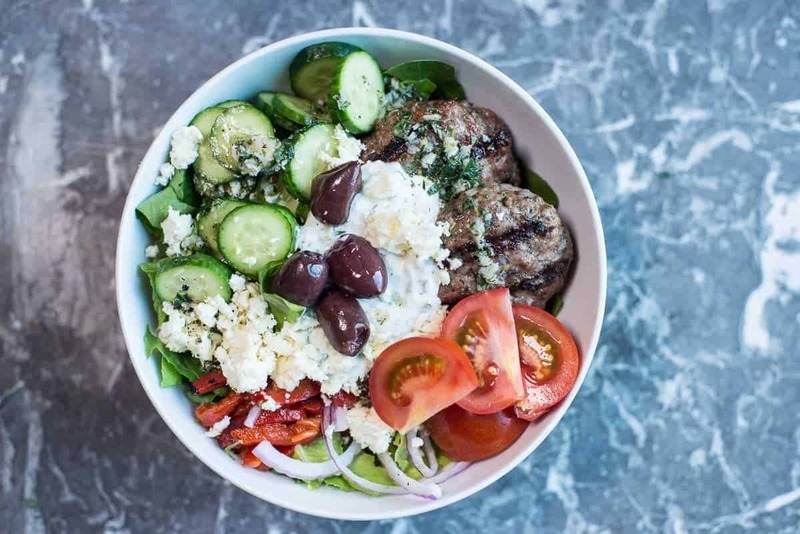 The Greek dressing and tzatziki are major flavor bombs in your mouth. Pro tip: make sure whomever you plan on kissing later shares one of these beast bowls with you because the garlicky deliciousness definitely lingers! There’s also feta, kalamata olives, and roasted red peppers. Throw all of this on top of a healthy serving of your favorite greens, add some cucumbers and tomatoes and you have a hearty delicious bowl that doesn’t feel like a salad at all. I wish everything in my life was as adaptable as a Beast Bowl. 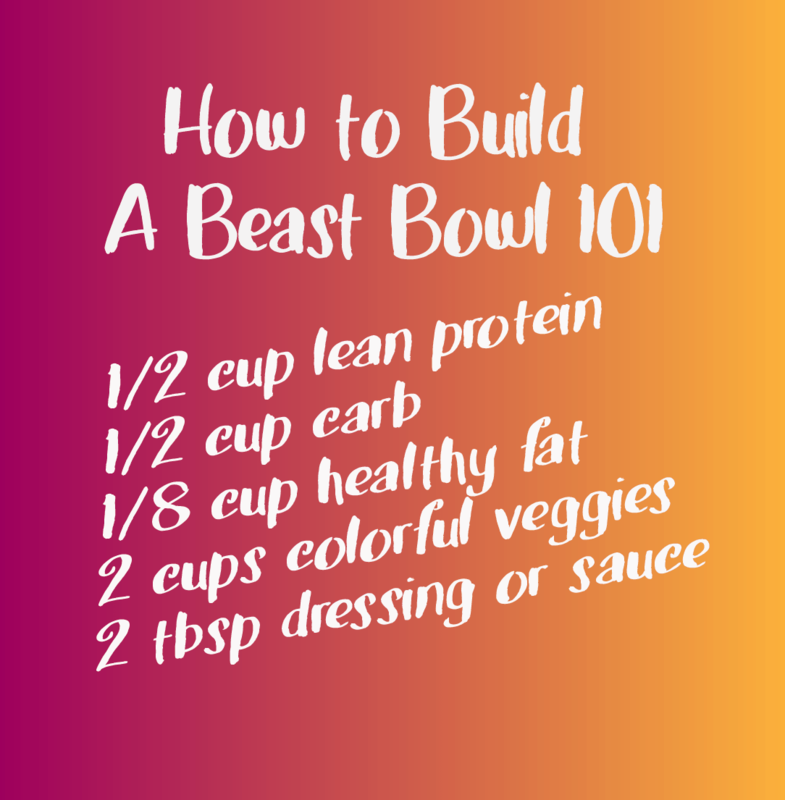 All you need is the Beast Bowl formula: a protein, a carb, a bit of good fat, some veggies and some tasty sauce. For this one, I like to make these mini-burgers using a cookie scoop. This results in each burger being about 2 ounces, which makes portion control a breeze later in the week when you are pre-packing meals. Adding some couscous or quinoa can also give you some carbs if you need the extra fuel. Pro Tip no.2: I like to pre-cut my veggies but keep them separated when packing for later, especially tomatoes – they can cause the other veggies to wilt. I put the tomatoes and cucumber together in a separate container and dump it on my bowl at lunch. Tzatziki is one of my favorite condiments – I eat it on roasted vegetables and oven roasted potatoes. Tonight I threw some on steamed asparagus. YUM! It’s also great on almost any grilled meat. Tzatziki is basically just yogurt, cucumber, garlic, dill and lemon juice. What is not to love in that scenario? It is a sauce that you need to have in your cooking arsenal because eating healthy is a lot more fun when it tastes amazing! Add meat and all spices to a large bowl. Add onions, garlic and lemon zest. Mix Well. Using large cookie scoop, form into patties. Mix yogurt, garlic and dill, lemon juice, and olive oil. Press the liquid out of the cucumbers and then add to yogurt mixture. Select the add-ins that you like. Shoot for about 1 cup of greens and a combined 1-2 cups of other chopped veggies. Top with olives, feta and tzatziki. For an extra boost of carbs add about ½ cup tabouli or cous cous.